Ever thought about a glider? 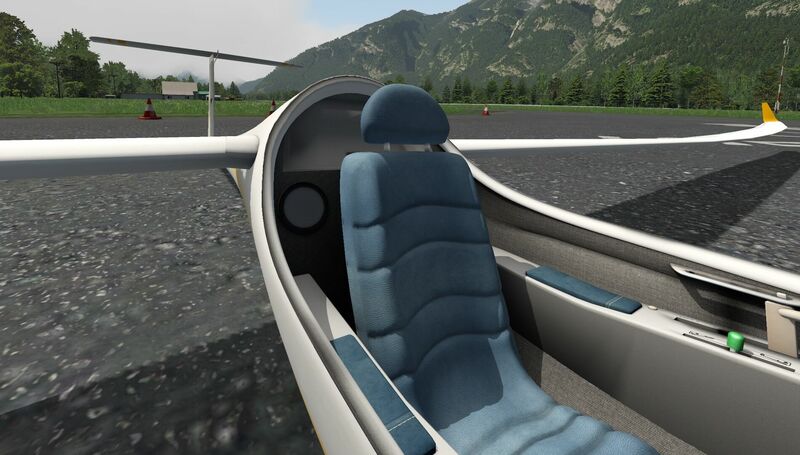 X-Plane 10 and 11 unfortunately don’t have many glider models. In fact, the only glider, the ASK21, they offer isn’t something to become excited about. That’s what Aerobask lead developer Stephane Buon also thought …. 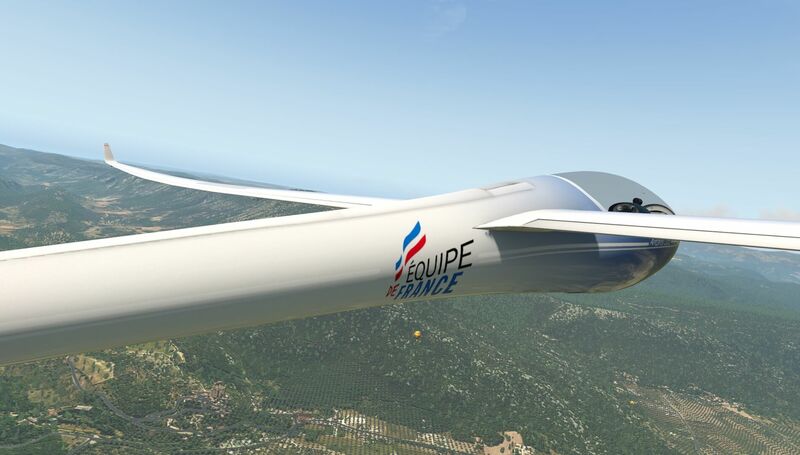 let’s go for a realistic and good looking professional glider. And there she is … the Lange Aviation Antares 20E. 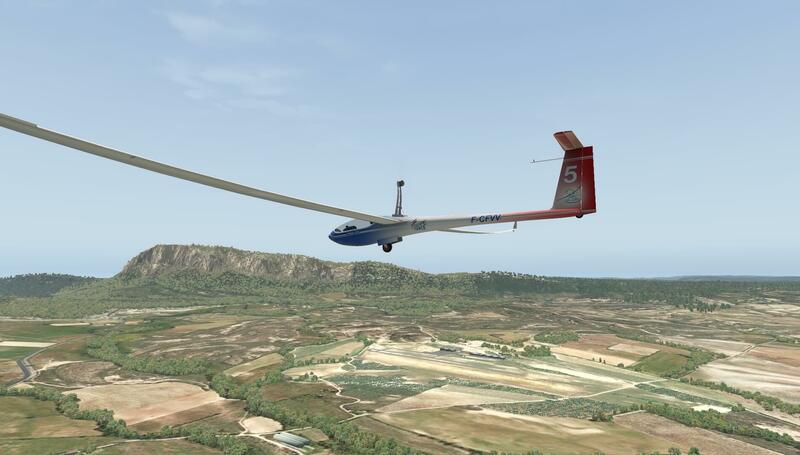 When you’re not familiar with gliders there won’t be a bell ringing; however, when you know a little more about gliders, you will see how well this Aerobask Antares 20E is made and how great it flies, but hold on, does X-Plane offers the right environmental conditions or in other words …. does it offer good thermals, ridge lifts and wave lifts? 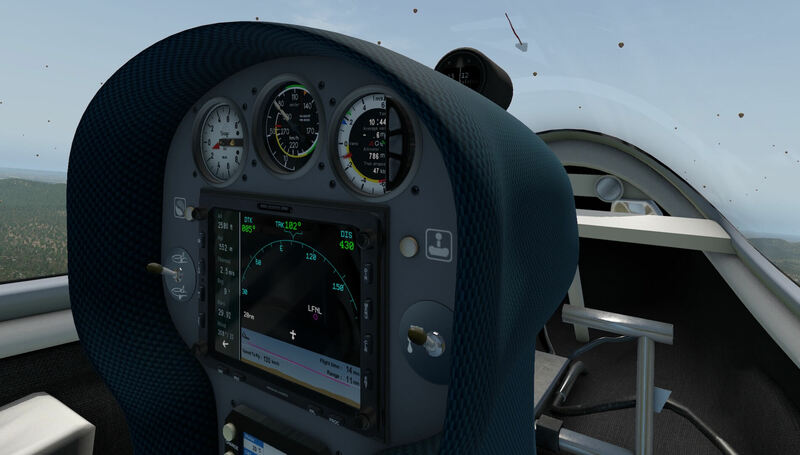 X-Plane does offer thermals and ridge lift adjustments, but they are, as the experts say, far from perfect. 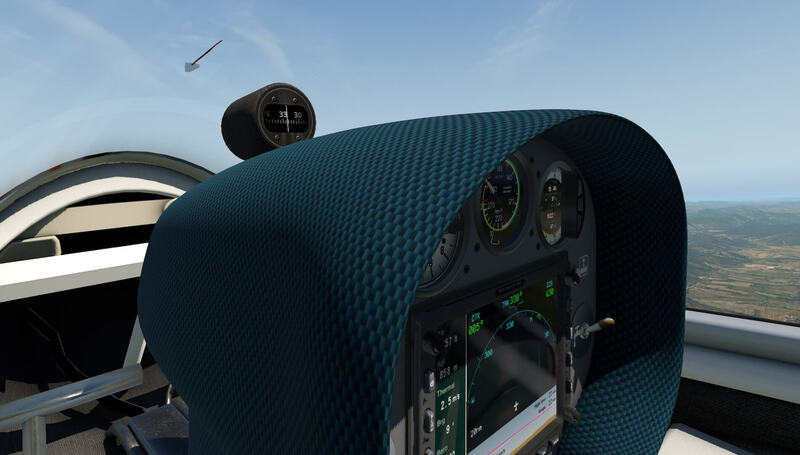 That said, it’s a good idea to install for this glider the thermal plugin from Alex Ferrer. More about that later. 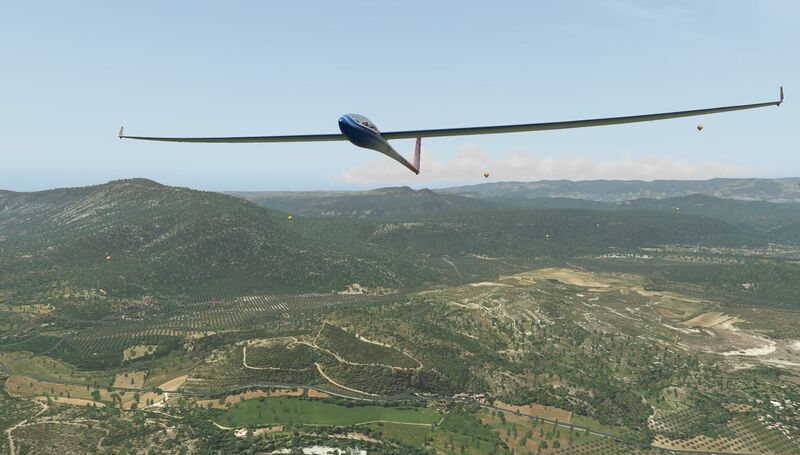 Flying a glider is something totally different from using a motor powered GA aircraft, but don’t underestimate the performance of gliders. 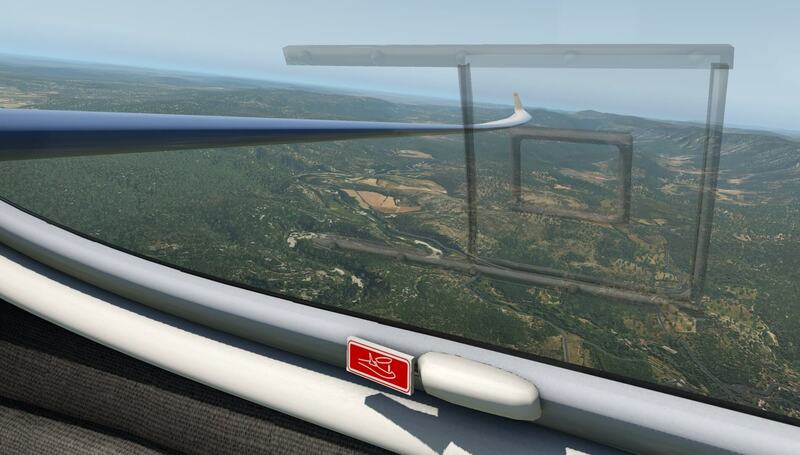 Together with Alex Ferrer’s thermal plugin and some ortho-photo scenery down below, it could lead to a new impressive lifetime flying experience. Want to give it a try? Then I would suggest that you continue reading this Aerobask Antares 20E review. Before you will fly the Antares, I suggest that you first read the “Flight_Manual_Antares20E”, the “Fly_your_glider_in_X-Plane” and the Install_recommended_settings (more about this manual later in the review) Acrobat files. Why and where can you find them? Why is not so difficult to answer. The manuals offer a lot of tips and tricks, what all those instruments are and how to operate and use them. Further on, what they do, but above all … enough tips for making the glider experience even more sensational. You can find these manuals in the Antares 20E “Documentation” folder. But where should you install the Aerobask Antares 20E? That’s very easy. 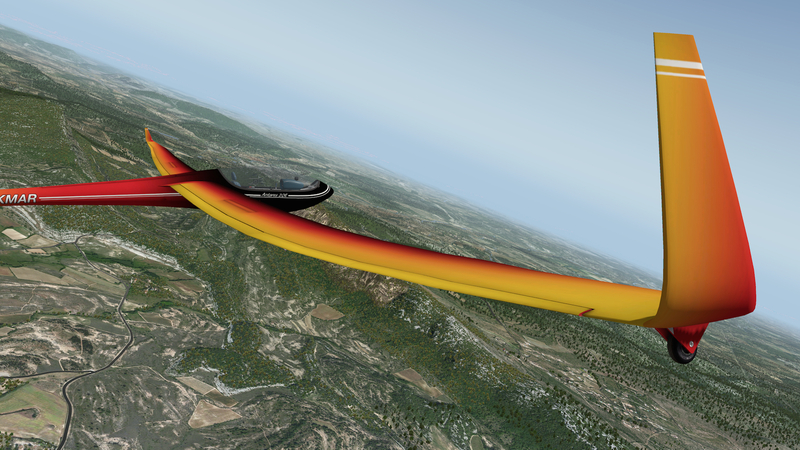 Just copy and paste the complete Antares folder to the X-Plane 10.51 Gliders folder. When you use the Antares with X-Plane 11, then you can install the package in the “Laminar Research” folder or you create under “Aircraft” a subfolder Aerobask and paste the Antares in here. The Antares 20E comes with nine liveries, some come with a French or German registration. A few only have a tail number, but it’s unclear to me in which country they are registered. The default start-up livery is the German registration D-JEFE. A small note regarding the Antares 20E package version 1.3.1 is needed and that deals with the “acf” files. It can be found in the Acrobat “Install_recommended_settings.pdf” manual. When you load the package from X-Plane.Org, the Antares 20E is by default ready for X-Plane 11, but not for X-Plane 10.51. When you load the Antares in X-Plane 10.51, you get upon loading an error message telling you that it can’t open the acf file and the default X-Plane aircraft will be loaded instead. As said before, the “Install_recommended_settings.pdf” manual explains what to do, but I also know that not everybody reads the manuals, and therefore, the following section. 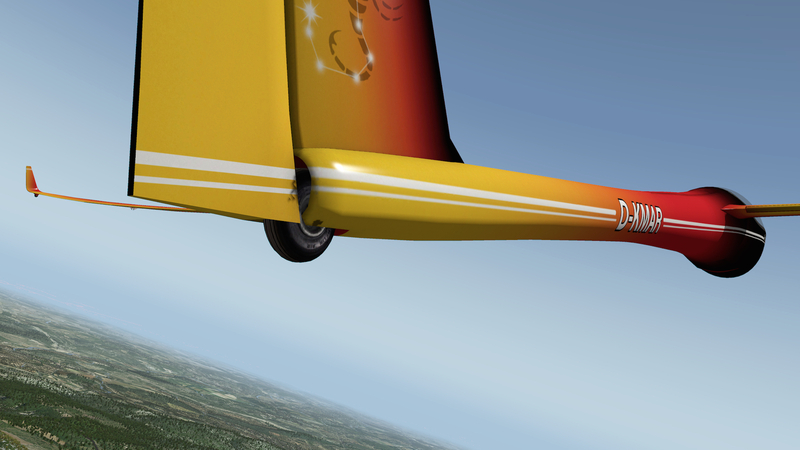 The first file (Antares20E.acf) is the ready-to-go for X-Plane 11. The 2nd file (Antares20E.acf.v10) is the one for X-Plane 10.51, but X-Plane 10.51 can’t read a file that ends with v10 instead of acf. That said, when you use the Antares with X-Plane 10.51, rename “Antares20E.acf” to for example Antares20E.acf.v11 and Antares20E.acf.v10 to Antares20E.acf. This will do the trick, and you’re ready to fly the Antares under X-Plane 10. What could that sentence mean? You could jump in the Antares 20E, use the “aerotowing” or “winch launch” and off you go, or you could first create the ultimate scenery environment for your flight. Let me help you out. 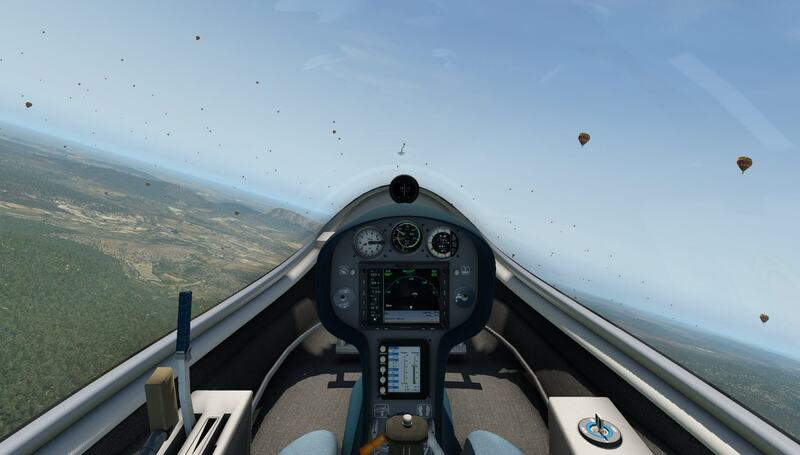 Stephane Buon, lead developer of Aerobask comes with a couple of suggestions in his “Fly_your_glider_in_X-Plane” document. 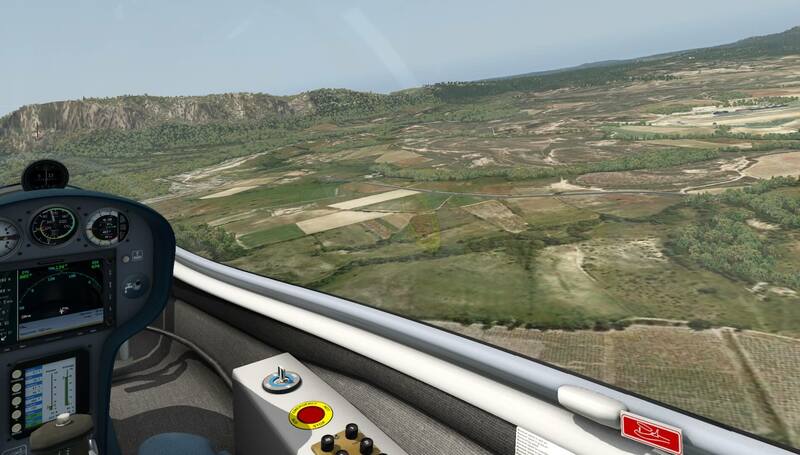 I’ve picked out one of these suggestions and that is that I download and installed a small French airport in southern France, namely Saint Martin De Londres (LFNL). You can download this airport scenery via this link. I strongly suggest that you also install a photoreal scenery from Zones Photo (ZL16 files). For more information visit the ZonesPhoto website. At Zone Photo X you need to look for file +43+003 Beziers which is ZL16 quality. And finally, should you install Alex Ferrer’s plugin? I strongly suggest you do, but you can also follow the instructions in the manual on how to set the default X-Plane thermals and wind rifts. When you don’t feel comfortable during several flights and having the idea that there are not enough thermals available, then you should install Alex Ferrer plugin. The manual offers a kind of tutorial how to do this. 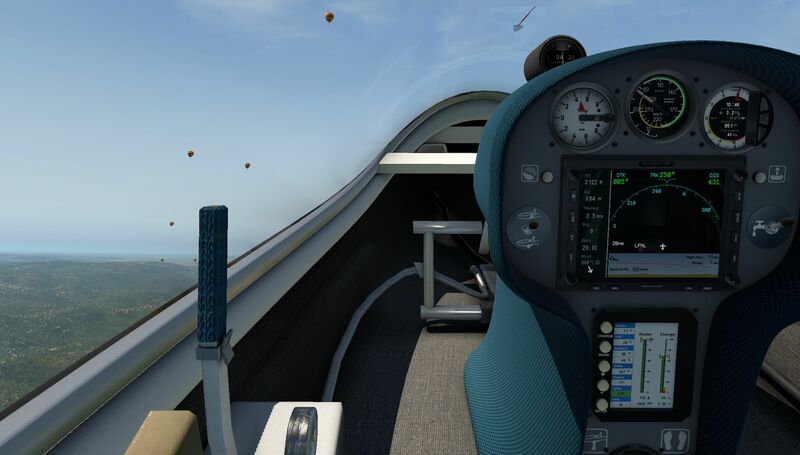 That said, this first flight impression with the Antares 20E is with X-Plane 10.51. I use for my first glider flight the aerotowing option. You’re pulled into the air with the help of an aircraft, but oh my goodness, that’s not easy for the first time. It seems that keeping in line with the tow aircraft isn’t as easy as I expected. Before you know you’re flying way too far to the left or right of the aircraft you’re connected to. 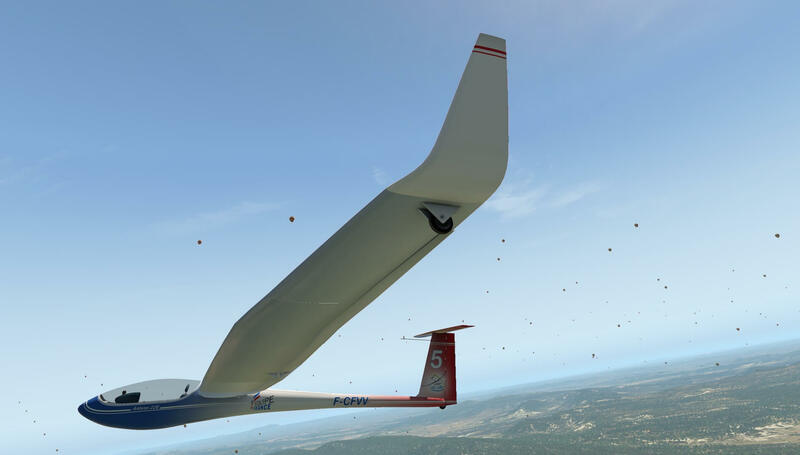 But believe me, after a few more of these aerotowing glider tests, you will get better control of your glider to keep it more in line with the tow aircraft. Oops, not familiar how to connect to a tow aircraft? Go to the XP menu “Aircraft – Aircraft & Situations tab Situations. Seek for button “Glider-Tow” and click this. Read the popup window carefully and then click “Understood” and follow the on-screen information. When you’ve released the glider brake, the tow aircraft will accelerate and you will follow, logically. Once the tow aircraft starts to climb, try to follow the tow aircraft as mentioned before. Perhaps you got it right from the beginning, but it can happen that you’re way off from the centerline of the tow aircraft. Climb to at least 4000 feet or preferable a little higher. I know it’s all very exciting to fly this Antares 20E for the first time, but don’t forget to retract the main wheel via the switch on the instrument panel. Although we’re still pulled by a towing aircraft, it’s really gorgeous to see how gently the wings are bended in an upward direction. Not only that, the whole Antares 20E is very well modeled and looks as real as it gets, in particular when you compare it with real Antares 20E photos. The climb to 4500 feet goes steadily and the wind sound can be heard too. The powered towing aircraft can’t be heard since it’s too far away. 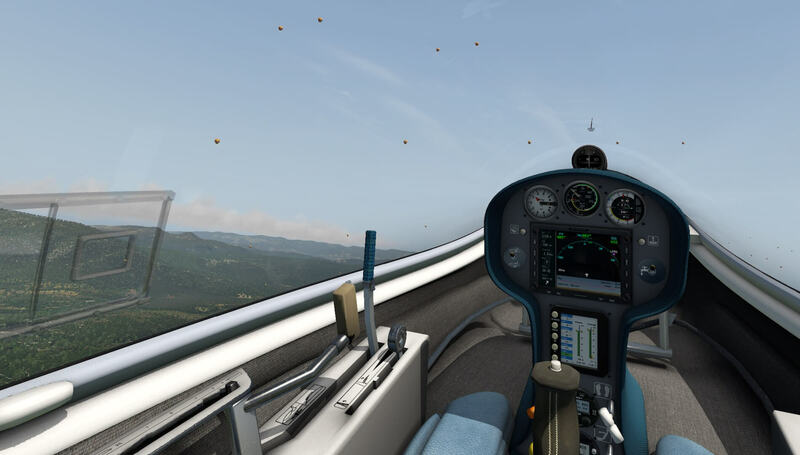 At approximately 4300 feet I decide to press the space bar once and gone is the tow aircraft and slowly it becomes a little quiet around the glider cockpit. But hold on, when there’s no lift, then most likely the first thing you will hear is STALL STALL! Oops what’s that! Welcome to the world of gliders! Don’t worry too much about this. 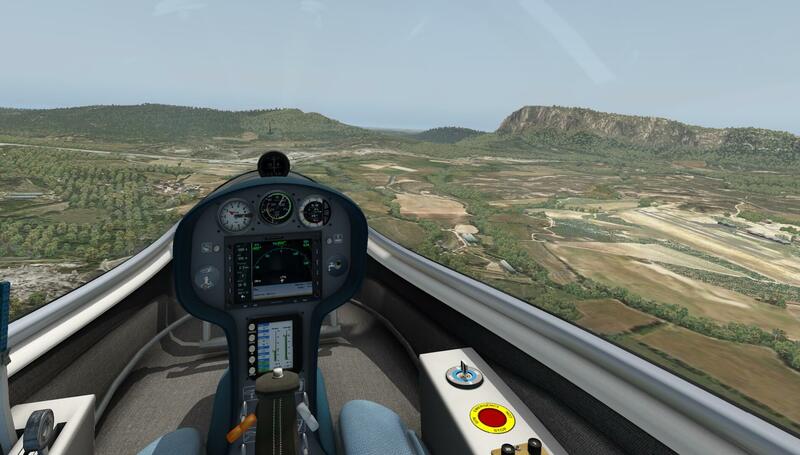 Lower the glider nose to -100 or -200 feet per minute and fly in the direction of a mountain. The variometer informs you about the current, no actual, vertical speed. When you’re lucky the variometer suddenly moves up to “+” vertical speed values which means that you’ve found an updraft of wind, thermal to be exact or a wind rift. There’s not a golden rule about where to get thermal drafts. When you think there’s nothing where you fly, make a turn towards another mountain rift and see if something happens there. And when you can’t find thermal drafts, remember, you always have a motor propeller onboard which you can extend. But I see it as a challenge to fly without the motor propeller and pick up somewhere some thermal drafts. I can’t say it enough …. The STALL STALL aural warning can be heard at moments you didn’t expect and with that aural warning, you know you need to pitch down a little bit. Don’t go over 400 feet/minute or more. You’ll lose in that case too much altitude in a short time and there’s not really a need for that. After a while I reached a stretched mountain ridge with a height of around 3500 feet, and although I could pick up some thermal drafts, it wasn’t much and climbing back to my initial starting altitude seems to be very difficult. Ho, hold on! This first flight was based on the default thermal settings in X-Plane and as suggested by me and Stephane Buon, it’s better to install the thermal plugin from Alex Ferrer. That said, let’s go back to the airport and let’s go install that plugin before starting with a second glider flight. Since the glider has no autopilot, checking all corners in the glider cockpit isn’t easy. I need to fly and can’t look in other directions without having my eyes on the outside world. No, checking the cockpit quality has to be done on the ground. 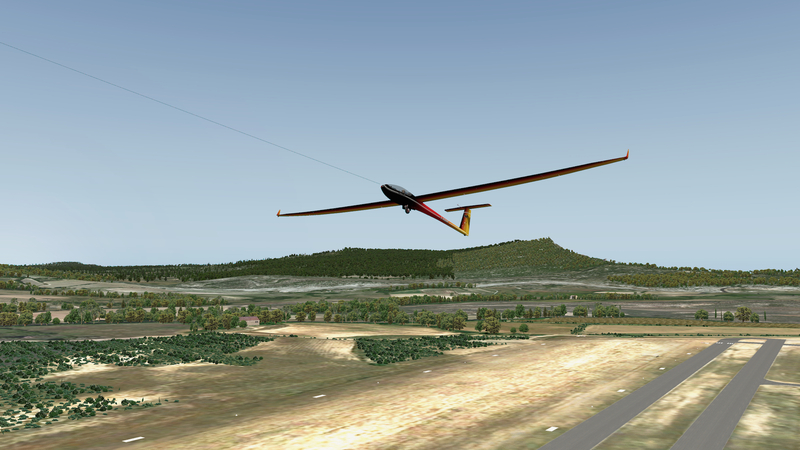 Preparing my first glider landing is something totally different from a powered aircraft. Ok, I could extend the propeller motor, but I want to give it one shot for a perfect landing. That’s much more difficult then I thought, but with the necessary preparations and precautions in mind, I managed to land on the grass strip parallel with the paved runway. But there’s not always a need to try to fly back to your starting airport. As Stephane Buon points out in his manual “If lift is not found during a cross-country flight, for example because of deteriorating weather, the pilot must choose a location to “land out”. Although inconvenient and often mistaken for “emergency landings”, landing out (or “outlanding”) is a routine event in cross-country gliding. 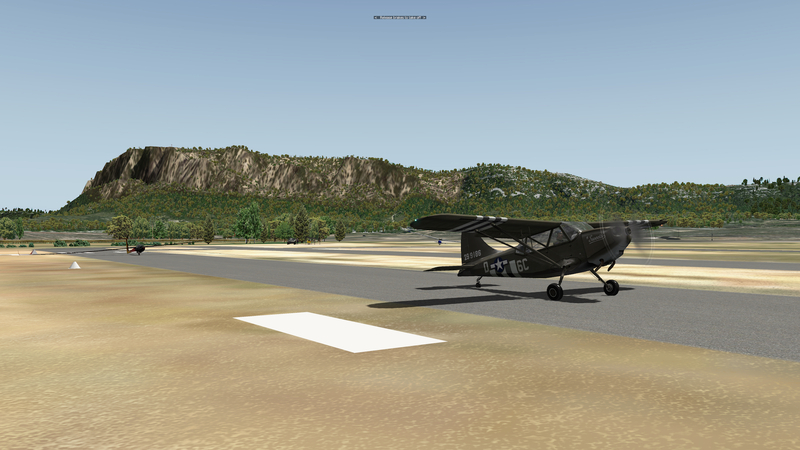 On this flight adventure, I not only use Alex Ferrer his thermals, I’m also flying with X-Plane 11.01. Ok, Alex Ferrer’s thermal plugin. How to use that? 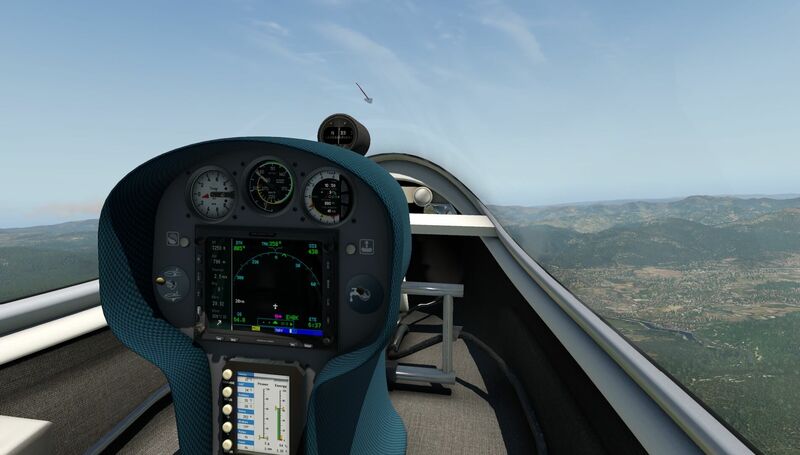 In the ‘Fly_your_glider_in_X-Plane’ Acrobat manual you’ll find a small tutorial, starting on page 17 which describes how to do this and which software is needed. You go ahead installing this software while I have the time to check out the 3D cockpit. 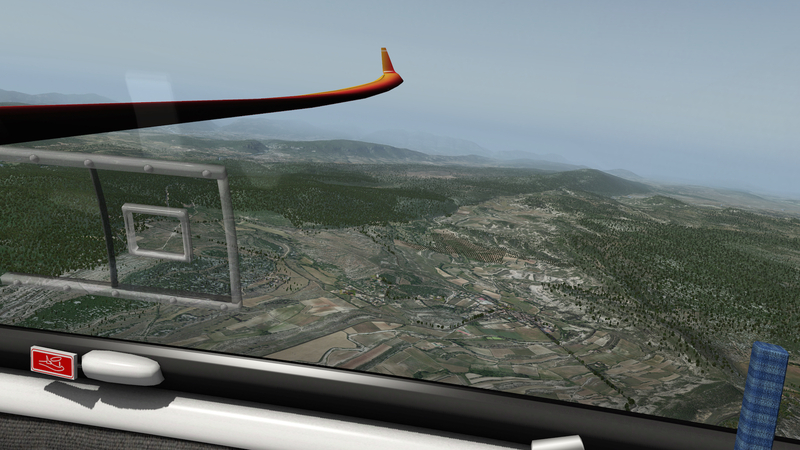 Although Stephane Buon wasn’t sure if this thermal plugin works, it does work with X-Plane 11.01 too. The best way to figure this out to “show” the thermals with balloons. 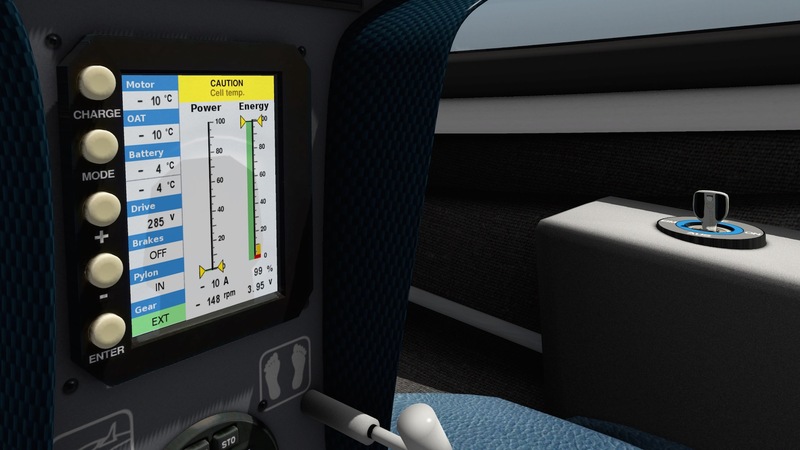 I’m aware that this is not realistic, but it’s the only way to see if the thermals are generated and above all when you’re not an experience glider pilot, to see where the thermals are and thus where to be in the air. With this working, it’s the right moment to start with my Antares 20E also in France, at LFNL. Via the opened canopy, oops, the gorgeous modeled canopy, you get access to the single seat Antares 20E. It’s a clean cockpit with an instrument module situated in the middle near the rudder pedals and a comfortable seat near the rear bulkhead. Although the instrument panel is equipped with several modern display units, it hardly influences the frame rates. The overall 3D cockpit construction is gorgeous and as far as I can see, nothing is forgotten. Every tiny detail is modeled. An example of this is, not as tiny as you might think, the leather cover around the flight stick. That’s so realistic. The only thing that is missing is the smell of leather. 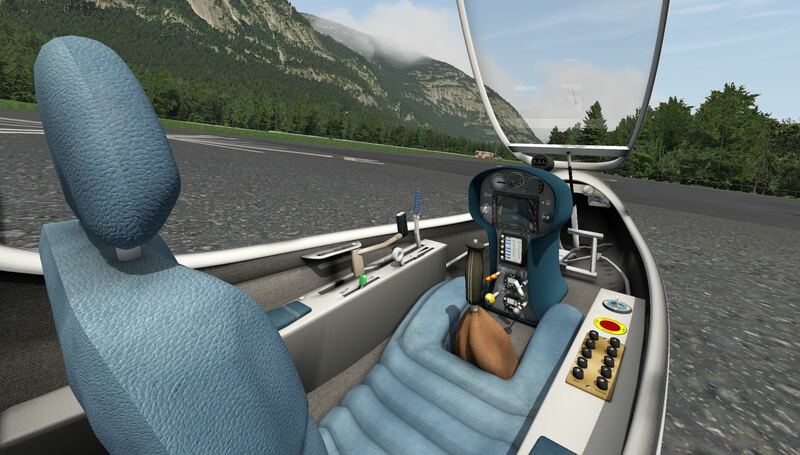 Flying gliders also means relaxation and with that in mind, look at the pilot seat. My goodness. It’s not just a seat, it a relax model that supports every part of your body including most of your legs. The right hand sidewall panel doesn’t offer many controls or switches besides the circuit breakers which are not modeled so you can’t pull/push them. The left hand sidewall panel has several handles for flap and speedbrake control. It also has the control handle to extend the motor propeller and to apply power. 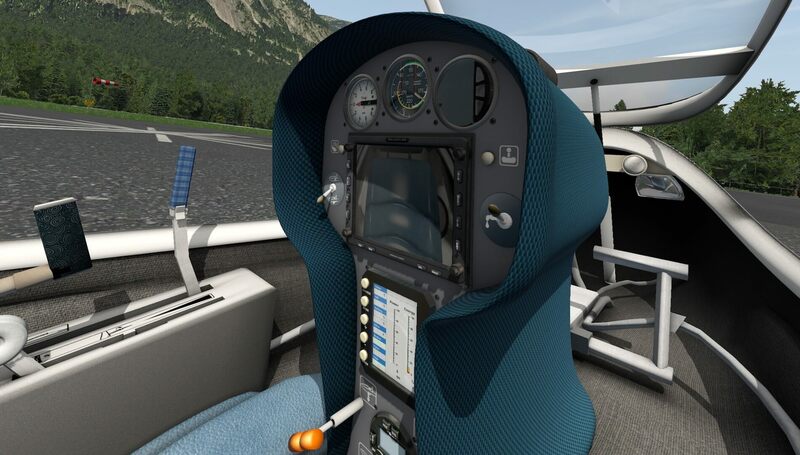 I checked this 3D cockpit versus some real pictures and I must admit that Aerobask has done a great job. 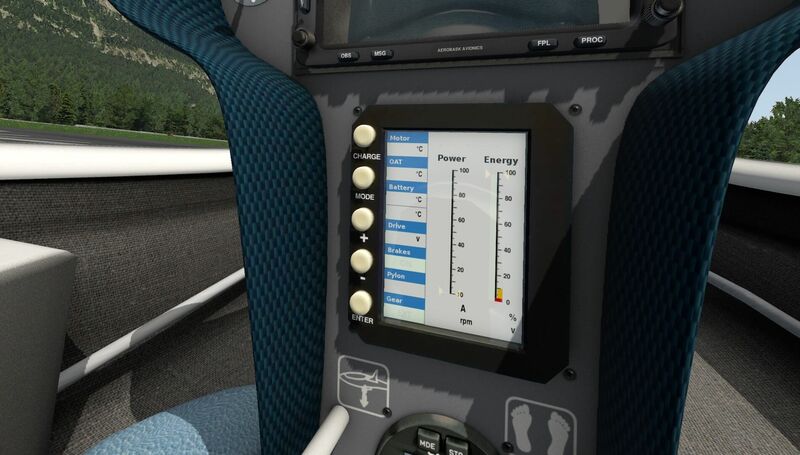 The middle console is another example of high quality modeling with razor sharp and clean decals. The lower section of the console has four handles which are, by the way, accurate replicas of the real ones, while the middle and upper parts of the console offers several display units and some old-fashioned indicators with, on the sides, some switches. Yes, I’m aware that this Antares 20E console isn’t as complex as an Airbus instrument panel, but it’s made with great detail, love and accuracy. The blue Kevlar console skin completes it all. From the seat I try to turn my head towards the extended motor propeller assembly. Not easy, but I manage it. It seems to be a huge and solid construction with the two-blade propeller on top. My second flight is with Alex’s thermals active. Just in case; read Alex’s text file with some background information about what his thermal plugin is doing. To make it as real as it gets, you leave the “visualization” of the thermal currents out of view, but if you have not much experience in finding thermal currents, you can decide to switch on “thermal visualization”. In that case, you’ll see balloons indicating where to expect thermals, but it’s of course far from realistic. Anyway, I decide as said before, to takeoff from runway 11, airport LFNL. Gaining altitude is done with the help of the default XP tow aircraft. When you’ve decided to disconnect the two aircraft once you’ve reached the required altitude, you simple press the space bar. When, after this action, you think you’re too low, you can always use the built in electrical motor/propeller. Just extend it and climb to the required altitude. Be aware that you can’t load the battery during flight, so use the electrical motor with care. You might need it at other moments to gain altitude. With Alex’s thermal street visual ON, it’s just a matter of flying in the direction of these balloons. Keep monitoring your vertical speed and altitude and watch out that your airspeed doesn’t drop below approximately 75 knots. If this happens, you’ll get a STALL warning. Another thing to keep in mind when passing a mountain ridge is that you can get a landing gear aural message. 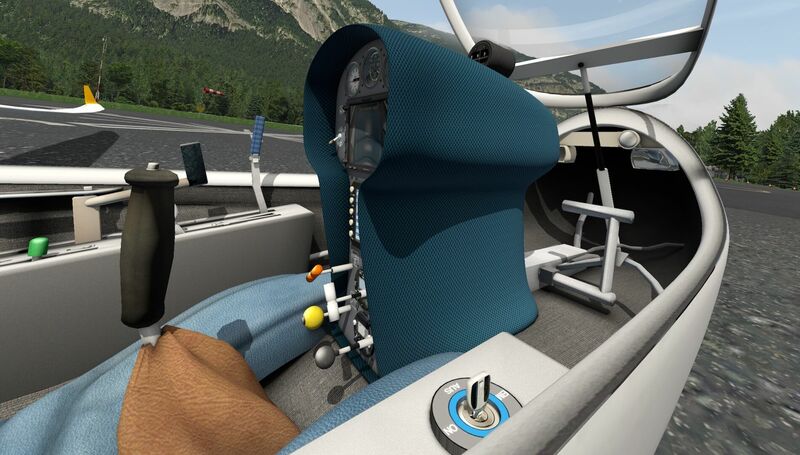 Since you had, I suppose so, retracted the main wheel upon climb, due to the low altitude flying over the mountain ridge, the system assumes you’re intended to make a landing which is not the case since you’re just passing over it. It’s really fun feeling and seeing on your instruments that you’ve reached a thermal current and that the modeled Antares reacts perfectly on this thermal. If you did it right, you can glide 1/2 hour, one hour, two hours or even longer without loosing altitude or even better, gaining altitude due to thermals. 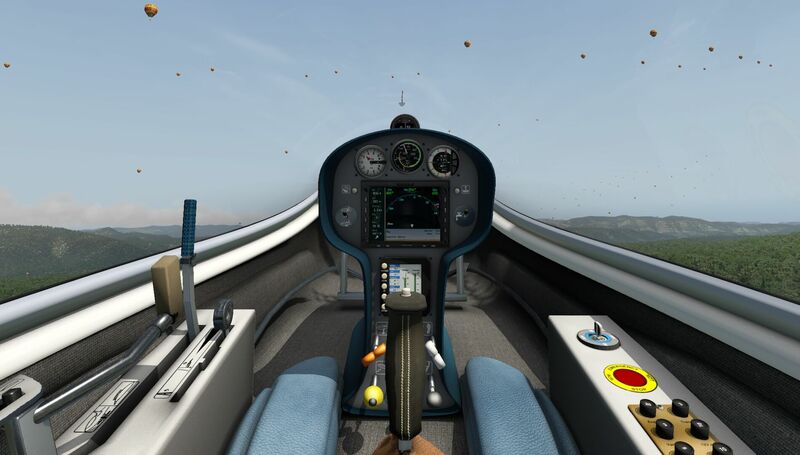 Of course, it will take some time to get the right feeling of how to control the glider, but you’ll succeed and you also need to see this as a challenge. Flying gliders is in that respect different from motorized GA aircraft. Planning a landing with a glider is different. There’s a big chance that you can’t land on your original airport and need to find a spot somewhere, preferable close to the airport. Once you’ve spotted somewhere where you could land, or better, you’ve already figured out several spots before your flight, it’s time to prepare the landing. A good combination with flaps, and if needed, speedbrake panels is essential unless you still have some electrical power to drive your motor/propeller. Perhaps the first, second or even third landing won’t be as perfect as you want, but you’ll get used to it and every landing will be better then the previous one. Believe in yourself as a rookie glider pilot, and practice, practice and even more practice will finally result in nice landings. Was it fun this second flight? I enjoyed it every minute, and not to forget the combination of the photo real scenery and Alex’s thermal plugin. Was it an easy flight? That depends one what you want to hear. Finding thermals isn’t always easy, even with the thermal current balloons visualized. Besides that, when your tow aircraft has brought you to an altitude of approximately 4000 feet or higher, you can glide for a long time and when needed, you can extend and start your electrical motor/propeller. While gliding, I tried to enjoy the external view which is beautiful with the ZL16 photo real scenery. Overall, a successful second glider flight. 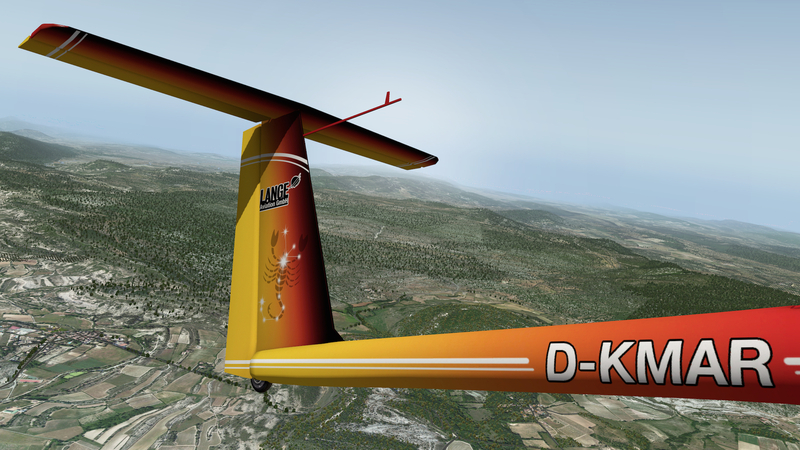 The overall modeling of the Aerobask glider is, as we know from Stephane Buon, of a high standard and excellent quality. It feels and looks gorgeous on the outside, but also the interior is very well made with great precision. And what I already said before, the instrument panel isn’t as complex as modern GA aircraft with Display Units, but it still has a lot of interesting instruments on board. Most important is, I think, the accuracy of these instruments in relation to your flight. 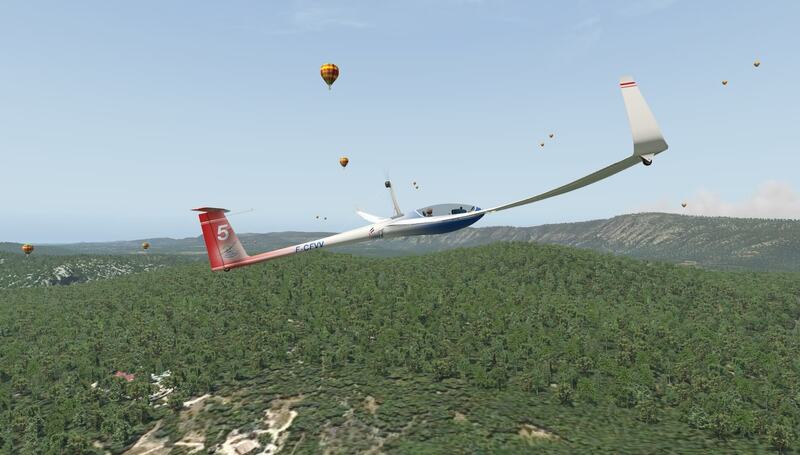 To get the best out of the Aerobask Antares 20E, it’s a good idea to test it for many hours to get the right feeling unless you’re an experienced virtual glider pilot or perhaps even a real licensed glider pilot. Does it offer good frame rates? No discussion about this. The answer is without doubt … yes. Does it offer nice sounds? Uhhhh, there’s not so much besides the wind and of course the electrical motor driven propeller. As usual there’s always the question …. Did I cover everything about this Antares 20E? For sure I’ve forgotten something, but I’m confident that I covered most information about this add-on glider. Whether you like gliding or would like to give it a chance, then I can advise you to check out the dedicated Aerobask Antares 20E web page for additional information. Interested, enthusiastic? Then check out the dedicated X-Plane.Org store page. What a coincidence that you tested this add-on again. I was just picking it up again and I was wondering if the thermal plug-in should work. Now I don’t have to find out myself but you did it for me 😉 A big thank you for that. What I missed was the description about the special flight computer. It is a great tool to monitor your sink rate with the audible tone. In my opinion this is the best add-on for X-plane. It flies beautifully and it gives me the feeling of real flying. I think this add-on makes maximal use of the X-plane’s flight model. 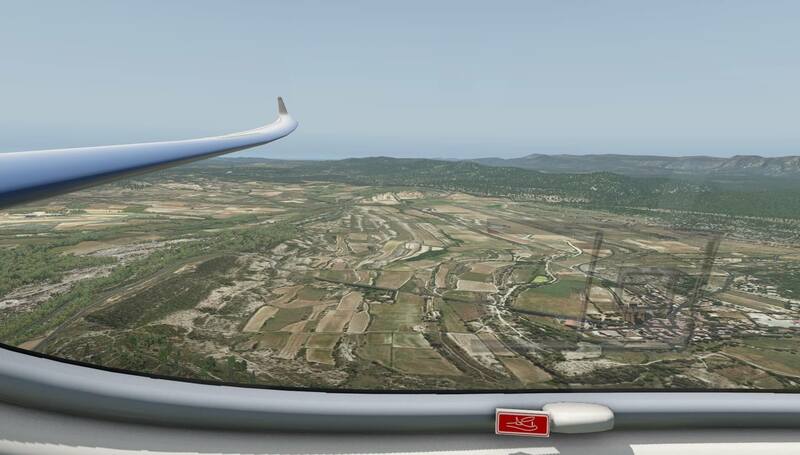 -Textures in Ultra-High Definition (4K) with Normal Maps and PBR textures for X-Plane 11!! 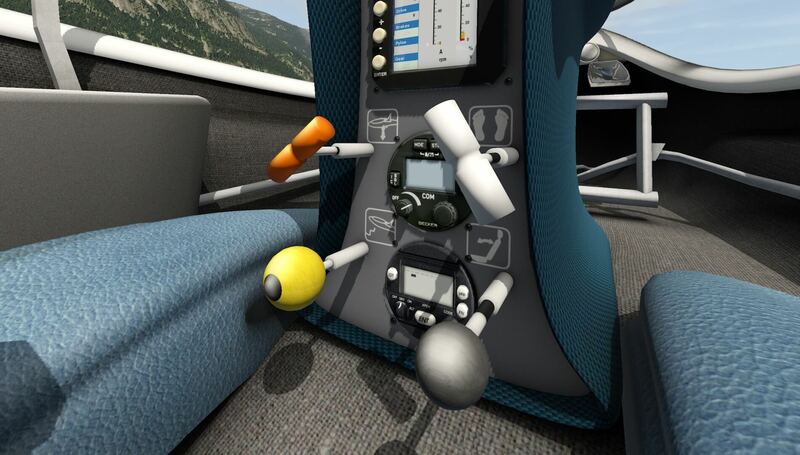 -Fully animated : mast, engine, window, canopy, gear, pilot, all levers, switches. 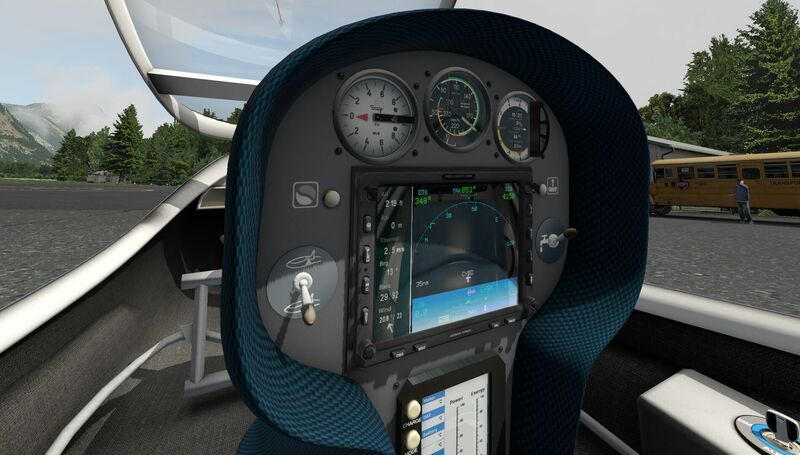 -Main screen LX aerobask included GNS530 and McCready function (with X-Plane limitations)! So this is an advanced glider. Thanks Angelique – after this review I just might have to buy this plane! It just sounds like so much fun and new X-Plane experience.